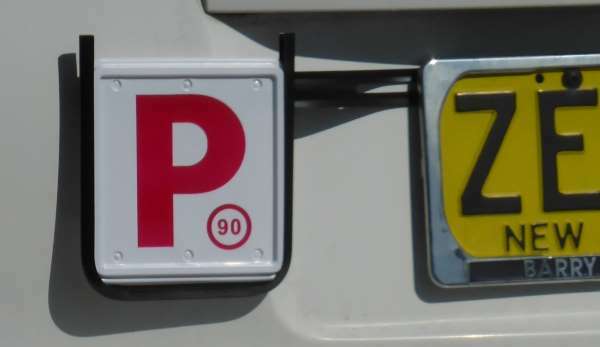 When displaying L or P plates, how much of the letter must be clearly visible? When displaying L or P plates, how much of the letter must be clearly visible? A. Most of the letter. B. Only enough of the letter so it is clear whether it is an L or P.
C. All of the letter L or P.
Correct. They must be displayed on the front and back of the exterior of the vehicle and not be obscured. The plates must be displayed on the front and back of the exterior of the vehicle and not be obscured, i.e. none of the letter must be hidden. Learner plates show an L, are in yellow, and show a speed limit of 90kph. 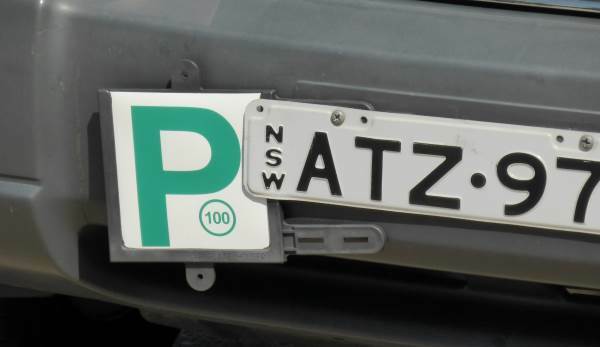 This image shows a red P1 plate displayed on the back of a car next to the licence plate. It shows the speed restriction for the driver (P1 drivers are restricted to 90kph). This image shows a green P2 plate with the 100kph restriction. The P2 plates are green.